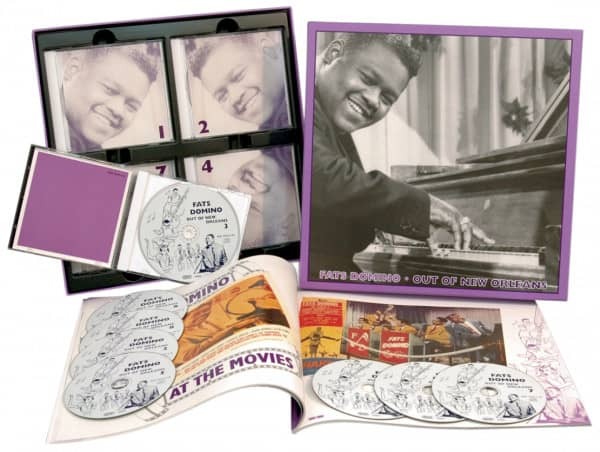 Republication of the legendary Fats Domino CD box set that includes all his Imperial recordings (1948 -1962). We decided to revive this great box set due to public demand and as our Tribute to the late great Fats Domino! This set will be a new revised edition that includes a new hardcover book. A celebration for eyes and ears! 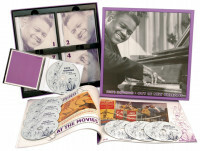 The exact release date of this Fats Domino box set is not set yet but you already can list yourself for an information e-mail we will send as soon as the release date is known. This was worth waiting for. It's every recording that Fats Domino made for Imperial between 1949 and 1962 In those years, he just about defined New Orleans R&B as it became rock 'n' roll. There's terrific variety here, amazingly few duds, and - even after all this time - some unissued, unedited and undubbed performances. The sound quality has been hailed by critics and fans as better than any other edition. There's a total of 219 songs, some in multiple versions (like Walkin' To New Orleans with and without strings). We all know that Fats Domino is one of the giants of the era, and here are all his greatest recordings in one place alongside the rare LP tracks, rare singles, and unissued sides that tell the complete story. 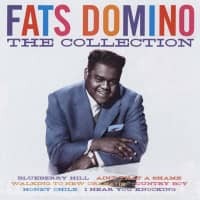 If you think you've heard it all by Fats Domino, you ain't heard nothin' yet! Like the great Louis Armstrong before him, Fats Domino was a perfect ambassador for New Orleans music. Even at the height of the mid-‘50s rock and roll explosion, when Elvis and Chuck Berry were scaring the bejeezus out of parents with their primal rhythms and suggestive stage antics, Fats was a cherubic presence when seated behind a piano with a sweet smile on his face and a fat horn section by his side. No wonder he was one of the era’s most prolific and universally accepted hitmakers; with trumpeter/bandleader Dave Bartholomew as his co-writer and producer, Domino unleashed an incredible run of hits on Imperial Records that were irresistible to teenagers and their parents alike. Fats always did the Crescent City proud. Domino, who died at the age of 89 in his beloved home in Harvey, Jefferson Parrish in New Orleans, Louisiana, at night on the 24th of October 2017, had been ailing in recent years after surviving the wrath of Hurricane Katrina in 2005 (he had to be rescued from his Ninth Ward home, which was utterly devastated). But prior to his health woes, Fats never stopped rocking like it was 1957 all over again, always fronting a rollicking band soaked in second-line rhythms and jabbing horns. Domino never seemed like he was just going through the motions; whenever he launched into his raucous set closer When The Saints Go Marching In, it was instant Mardi Gras time. Born February 26, 1928 in the Big Easy, Antoine Domino, Jr. was a shy lad of Creole descent who spoke French before he learned English. Influenced by boogie piano specialists Albert Ammons (whose Swanee River Boogie became one of Domino’s enduring showpieces), Meade Lux Lewis, and Amos Milburn, Fats was given his nickname by bassist Billy Diamond, whose band he played with at the Hideaway Club beginning in 1946. Domino was making a name in his own right by ’49, when he met Bartholomew, who brought Imperial owner Lew Chudd to the Hideaway to check out the promising newcomer. The end result was a record contract that would make immense profits for the label and Domino as it stretched for more than a decade. 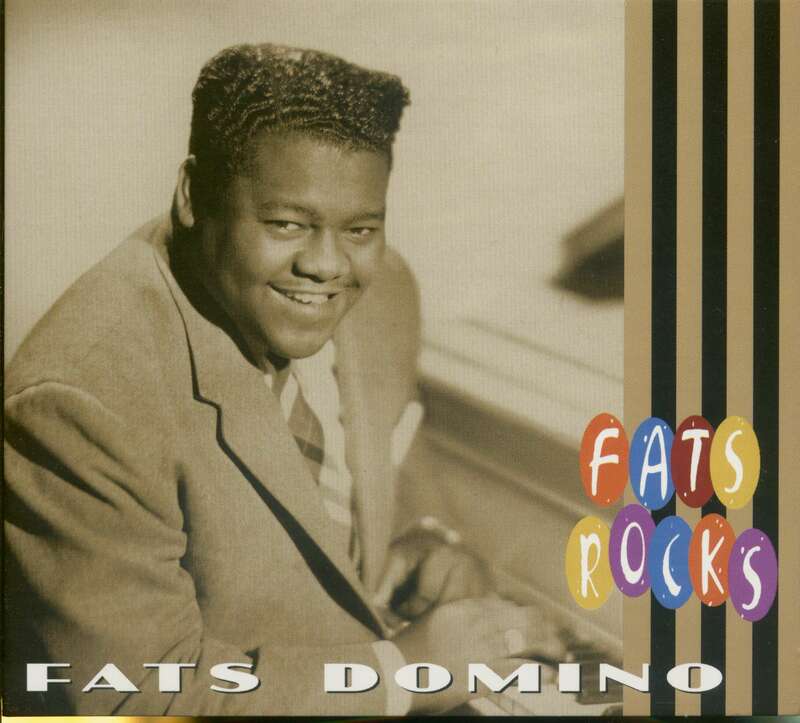 The Fat Man, a cleaned-up adaptation of Champion Jack Dupree’s Junker Blues, was Domino’s Imperial debut and just missed the top of the R&B hit parade in early 1950. Fats achieved R&B stardom long before rock and roll reared its impudent head, scoring major hits with Every Night About This Time (1950), Goin’ Home, Going To The River (both 1952), and Please Don’t Leave Me and Something’s Wrong (both 1953). Everything changed when Domino released the stop-time rocker Ain’t It A Shame in 1955. Typically a Domino/Bartholomew collaboration, it not only paced the R&B charts but went Top Ten pop despite a Pat Boone cover. Rock and roll was exploding all over, and Fats was one of the rowdy music’s first true heroes. Of course, having a crack band at his behest whenever he ventured into Cosimo Matassa’s studio in the French Quarter sure didn’t hurt. Herbert Hardesty, who was prominently featured with Domino’s band for decades, took the lion’s share of the sax solos on Domino’s hits, with studio stalwart Lee Allen handling the rest. For the rest of the decade, Domino was a rock and roll superstar, thanks to blockbusters that included I’m In Love Again, When My Dreamboat Comes Home, Blueberry Hill (his top seller of all), and Blue Monday in 1956, I’m Walkin’ the next year, Whole Lotta Loving in ’58, I’m Ready, I Want To Walk You Home, and Be My Guest in ’59, and the plaintive Walking To New Orleans and My Girl Josephine at the beginning of the new decade. Domino memorably guested in the rock and roll flicks ‘The Girl Can’t Help It,’ ‘Jamboree,’ and ‘The Big Beat,’ headlined countless package shows that barnstormed the U.S. and helped knock down segregation barriers, starred on network TV programs, and remained singularly free of scandal as he loyally doted on his huge family back home when he wasn’t on the road. After an amazing run on Imperial (all of his masters for the label are available on Bear Family’s eight-CD boxed set ‘Out of New Orleans’), Domino moved over to the ABC-Paramount label in 1963. But by then, the glory years of New Orleans rock and roll were long in the history books. Domino made more platters for Mercury and Reprise, often recording away from his home base, and toured far and wide as the oldies circuit welcomed him with open arms. Eventually Domino decided to retire from the road altogether, limiting his performances to venues that were close to home. New Orleans was filled with great performers during the ‘50s, but there was only one Fat Man. Monumentally influential to a generation or two of Louisiana musicians (especially the pioneers of the swamp pop movement), he was the very definition of New Orleans rock and roll—as all the gold records adorning his wall during the pre-Katrina days so eloquently attested. Customer evaluation for "Out Of New Orleans (8-CD)"
Alles bestens!! Super Aufmachung!! Bin immer wieder begeistert!! 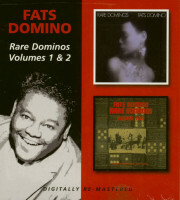 Press - Fats Domino - Out Of New Orleans - Blues & Rhythm Tony- Watsori Looks at the new Fats Domino Bear Family Box Set Of all the fabulous collections that Richard Weize has put together on Bear Family this is the one that has been, perhaps the most eagerly awaited, at least in R&B and rock and roll circles. As every single available Imperial master recorded by the Fat Man between 1949 and 1962 is included here, there is little need for a track listing. Press - Fats Domino - Out Of New Orleans - Record Collector 1993 Mining the rich seams of Fats' original recordings for the Los Angeles-based Imperial label in the 1950s and early 1960s, this compilation promised much, and certainly delivered. With 100 tracks, and an excellently researched booklet featuring verbatim interview material, this could have easily survived the decade as the last word in Domino retrospectives. But then came Bear Family. The German reissue label which does nothing by halves has done it again. 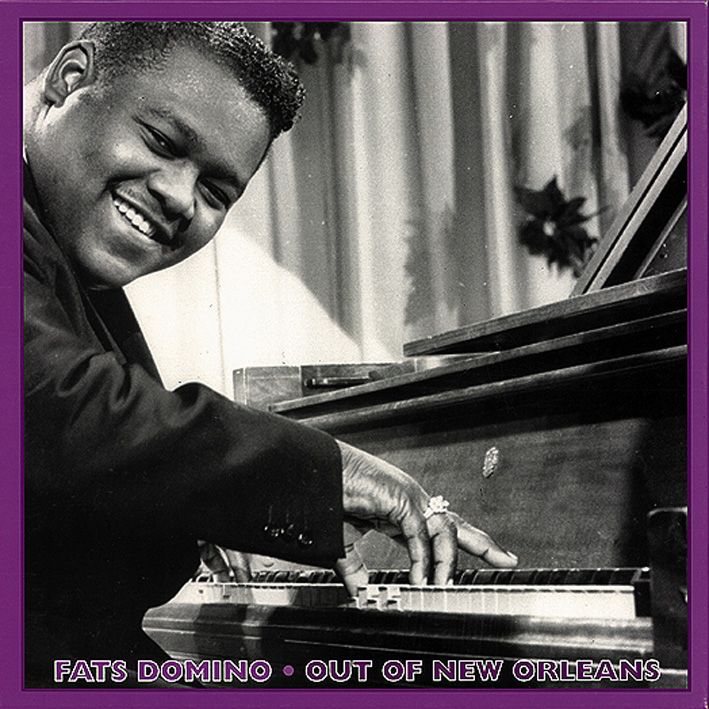 Press - Fats Domino - Out Of New Orleans - Blueprint April 1994 This is Bear Family's long-planned release of the complete Domino Imperial canon, put on ice when EMI issued their 'Best 100' set. That information alone will be enough for many of you. 'Complete Works' sets really allow the CD format to come into its own (with programming permitting all shades of listening, from the casual to the obsessive) and Richard Weize has set unsurpassable standards in the field. Press - Fats Domino - Out Of New Orleans - Juke Box 1994 Fats Domino had two distinctly different periods of stardom during the 1950s: his first as a successful R&B artist, with his output aimed at and tailored to suit the black record buying public of the post-war years, his second with unforeseen success as an international rock 'n' roll star selling to an increasingly white audience with his style suitably modified. 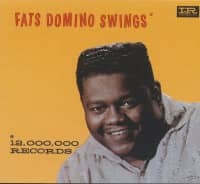 There can be few who are not familiar with Fats' R&R hits, and most either love them or hate them, but what went before, between and even after them may be of far more interest than expected to those yet to explore Domino's output. This excellent box gathers together for the first time Fats' entire recordings for Imperial Records, from 1949 to 1962, in chronological order, on to eight CDs. Press - Fats Domino - Out Of New Orleans - Now Dig This Dez. 1993 Here it is, the box-set that was deferred for two years after EMI released their 4xCD box in 1991. I bet that the modest Fats can't believe it - two box-sets of his Imperial output in two years, and Rick Coleman's book to come around the end of 1994! 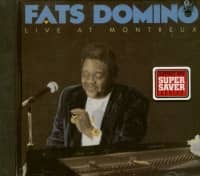 Press Archive - Fats Domino - Out Of New Orleans - AllMusic Strictly speaking, many of the 32 tracks on the 2018 compilation The Ballads of Fats Domino are not ballads. They're blues and slow-rolling R&B, songs that seem to define the Big Easy sound of Fats: "Blueberry Hill," "Blue Monday," "One Night," "Poor Me, "Before I Grow Too Old," "Natural Born Lover," and "I Hear You Knocking." They're surrounded by lots of songs that could conceivably be called ballads, but the feel of the comp isn't sweet and anodyne. Some of the tempos may be slow, but this is an R&B and rock & roll record through and through; it just happens to lean toward an easier roll. That sustained feel is appealing, as is the fact that this compilation is filled with songs that aren't hits but aren't slouches either. For some listeners, this may be a good way to launch an exploration of his classic Imperial period.